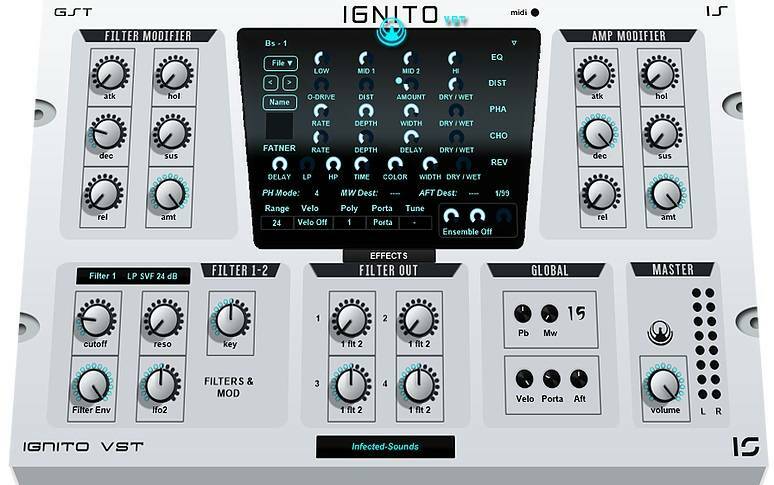 Infected Sounds has released the VST Player/Rompler Ignito. Ignito is an synth with an filter modifier also and amplifier and it got 4 filter out for each chanel and double filters with env control and lfo control, and there is 2 vowel filters, also there is an stepseq included, it got pitch bend and mod wheel and aftertouch, porta with slide mode, Up to 16 voices polyphony, one main octave, bend range, velocity on/off, very handy for fast sounds, 99 Presets. Equalizer, Overdrive, Distortion, Decimator, Phaser, Chorus, Reverb, Ensemble, Fatner. Ignito is now available for only 35,- Euro.